Sparkling Water and H2O are very good in terms of performance for data science projects. But if something works beautifully in one environment, not working in another environment could be the most annoyed thing in the world. This is exactly what had happened at one of my clients. They used to use Sparkling Water and H2O in Oracle BDA environment and worked great. However, even with a full rack BDA (18 nodes), it is still not enough to run big dataset on H2O. Recently they moved to a much bigger CDH cluster (non-BDA environment) with CDH 5.13 installed. Sparkling Water is still working, however there was one major issue: parquet files can not be read correctly. 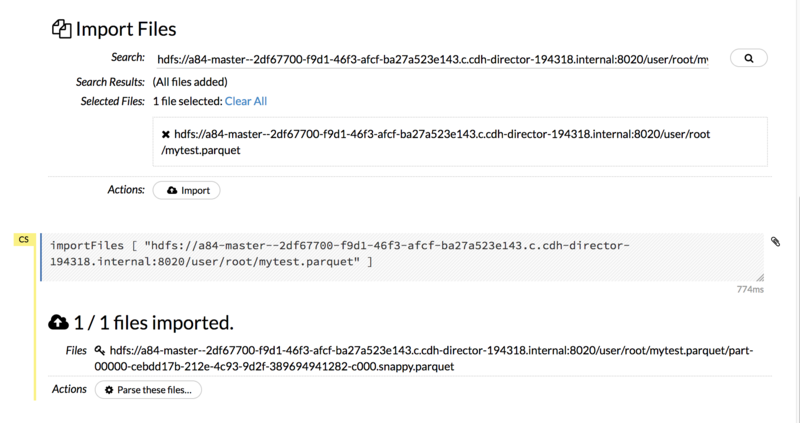 There are no issue in reading the same parquet files from Spark shell and pyspark. This is really an annoying issue as parquet format is one of data formats that are heavily used by the client. After many failed tries and investigation, I was finally able to figure out the issue and implement a workaround solution. This blog discussed this parquet reading issue and workaround solution in Sparkling Water. I did the test in my CDH cluster (CDH 5.13). I first created a small test data set, stock.csv, and uploaded to /user/root directory on HDFS. Run the following in spark2-shell to create a parquet file and make sure that I can read it back. I started a Sparking Water Cluster with 2 nodes. Spark context available as 'sc' (master = yarn, app id = application_1518097883047_0001). Open H2O Flow UI and read the same parquet file. After click Parse these files, got corrupted file. As BDA has no issue in the same Sparkling Water H2O deployment and BDA used CDH 5.10, I initially focused more on CDH version difference. I built three CDH clusters using three different CDH versions: 5.13, 5.12 and 5.10. All of them show the exact same error. This made me rule out the possibility from CDH version difference and shifted focus on the environment difference, especially class path and jar files. Tried setting JAVA_HOME, SPARK_HOME, SPARK_DIST_CLASSPATH and unfortunately none of them worked. I noticed /etc/spark2/conf.cloudera.spark2_on_yarn/classpath.txt seem have much less entries than classpath.txt under spark 1.6. Tried adding back the missing entries. Still no luck. 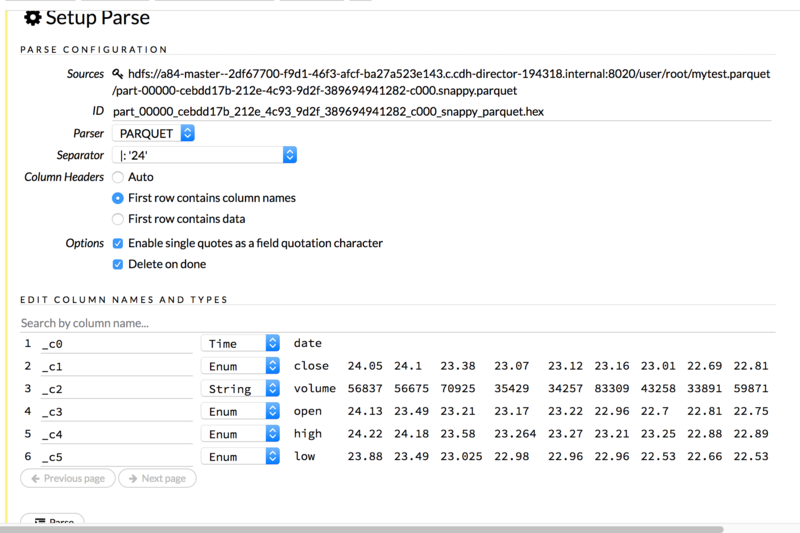 Added two more parameters to get more information about H2O log. It gave a little more useful information. It complained about class ParquetFileWriter not found. 1. The above command would create 70 nodes H2O cluster. If using Sparkling Water, it would be evenly distribute to all available nodes. But the above h2odriver.jarapproach would heavily use a few hadoop nodes. For big dataset, majority of activities happened only to 3~4 nodes, which made those nodes’ cpu utilization close to 100%. 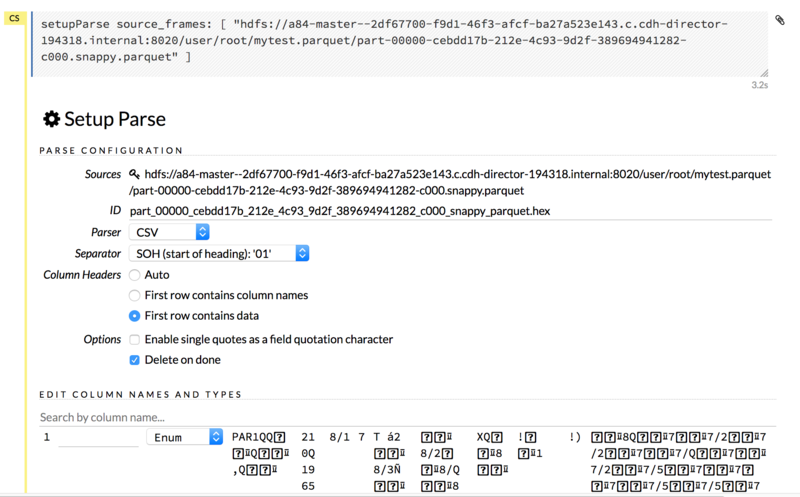 For one test big dataset, it has never completed the parsing file. It failed after 20 minutes run. 2. Unlike Sparkling Water, it actually read files during the parsing phase, not in the importing phase. 3. The performance is pretty bad compared with Sparkling Water. I guess Sparkling Water is using underlined Spark to distribute the load evenly. 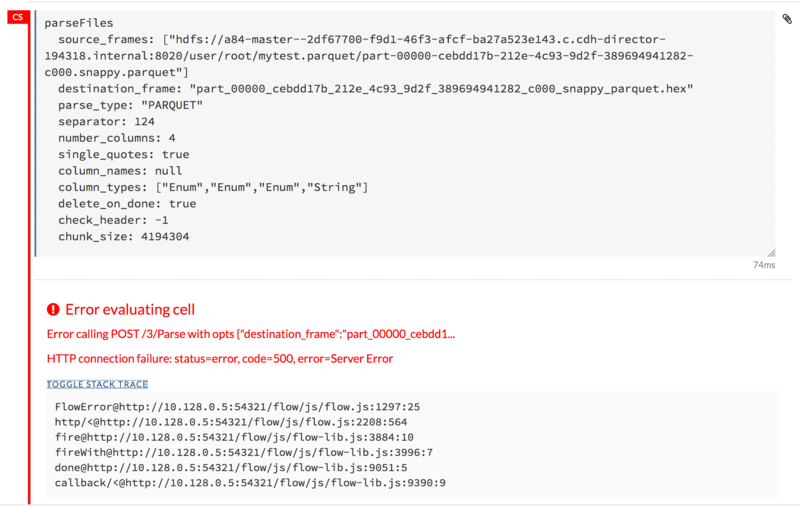 Anyway this hadoop jar h2odriver.jar solution is not an ideal workaround for this issue. Then I happened to read this blog: Incorrect results with corrupt binary statistics with the new Parquet reader. This article has nothing to do my issue, but it mentioned about parquet v1.8. I did remember seeing one note from one Sparkling Water developer discussing should integrate with parquet v1.8 in the future for certain parquet issue in H2O. Unfortunately I could not find the link to this discussion any more. But it inspired me to think that maybe the issue is that Sparkling Water depends certain parquet library and the current environment don’t have it. The standard CDH distribution and Spark2 seem using parquet v1.5. Oracle BDA has many more software installed and maybe it happened to have the correct library installed somewhere. It seems H2O related jar file may contain this library, what’s happened if I include the H2O jar somewhere in Sparkling Water. With this idea in mind, I download H2O from http://h2o-release.s3.amazonaws.com/h2o/rel-wheeler/4/index.html. Unzip the file and h2o.jar file is the one I need. I then modified sparkling-shell and change the last line of code as follows by add h2o.jar file to jars parameter. #spark-shell --jars "$FAT_JAR_FILE" --driver-memory "$DRIVER_MEMORY" --conf spark.driver.extraJavaOptions="$EXTRA_DRIVER_PROPS" "$@"
spark-shell --jars "$FAT_JAR_FILE,$H2O_JAR_FILE" --driver-memory "$DRIVER_MEMORY" --conf spark.driver.extraJavaOptions="$EXTRA_DRIVER_PROPS" "$@"
Restart my H2O cluster. It worked! Finally after many days work, Sparkling Water can work again in the new cluster. Reloading the big testing dataset, it took less than 1 minute to load the same dataset with only 24 H2O nodes. The load was also evenly distributed to the cluster. Problem solved!